How Does the AEF Help Bald Eagles? AEF Hack Tower on Douglas Lake in East Tennessee. © American Eagle Foundation. 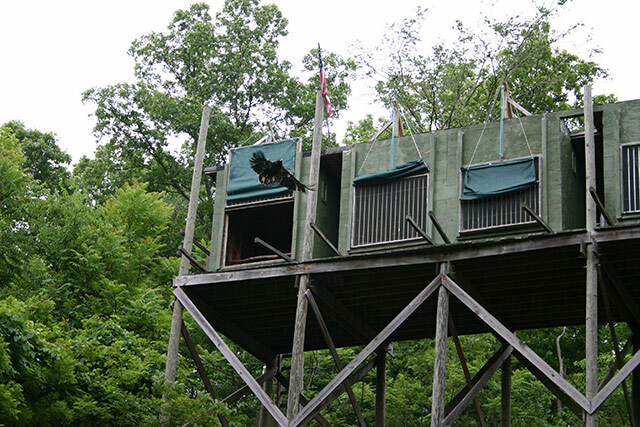 A hack tower is an artificial nesting structure overlooking a wild, natural habitat area where eaglets are placed at about 7 weeks of age, to be released into the wild at about 13 weeks of age in order to help repopulate a geographical area. The theory behind a hack tower is that eagles will often return to an area where they first learned to fly. By the end of 2017, in cooperation with the Tennessee Wildlife Resource Agency & the United States Fish & Wildlife Service, AEF has released a total of 150 young Bald Eagles from its Douglas Lake, TN hack site, the largest number of any hack releases in the state. AEF has assisted the Tennessee Wildlife Resources Agency and other partners in the hacking of hundreds of other eaglets. How can Bald Eagles benefit from the sale of Bald Eagle Commemorative Coins? How does the AEF rehabilitate injured Bald Eagles? The University of Tennessee School of Veterinary Medicine cares for injured or sick birds which come under the care of the American Eagle Foundation. In addition, we have a tech vet on staff. The AEF has full flight structures where birds are rehabilitated and regain their flying skills. After determining that an eagle (or other raptor) has regained its ability to survive in the wild, that individual is released at or close by the same location where it was found injured. What if an eagle cannot be released because of its inability to survive in the wild? The AEF will care for the bird at its state-of-the-art facilities. It might be an educational bird, or it may be placed in the Pick-a-Mate section of our Eagle Mountain Sanctuary aviary to be with others of its kind. It might eventually decide to bond with another eagle. If that happens, and nesting activities are observed, the pair will be given a private compartment of their own so they can raise babies of their own. What happens to the babies born to non-releasable eagles? They remain with their parents for 6-7 weeks in the nest; then they are taken to a very large artificial compartment, called a Hack Tower, overlooking Douglas Lake in East Tennessee. The transfer to the hack tower needs to be made just before the eaglet(s) begins to peer downward to the ground and Park at about a 45 degree angle. They could then possibly see AEF staff placing food on the ground inside the aviary, so that the eagle parents can deliver it to the eaglets in the nest. This could easily result in the eaglet’s permanently associating humans as their food source, and thus not learning to fish for themselves, and therefore risk starving to death. Likewise, if the eaglets get too familiar with the Dollywood Park patrons by viewing them from 80 feet away for a few weeks, they would tend to lose their wildness to the degree that their well-being would be significantly diminished. At the hack tower, they will acclimate to the area, grow strong inside their vast compartments, and fly free into the Smoky Mountains at about 13 weeks of age. They are tagged and banded so that if people see them after a time, the eagles can be identified and records of their travels and age can be determined. How does the AEF educate the public about Bald Eagles & other birds of prey? Shows, tours, and exhibits; programs; appearances by Bald Eagle Challenger, public outreach; live HD nest cams; our website and social media; e-Newsletters. More information can be found here.